Living up to their vision to help define Canadian Cuisine, Edible Canada launches an all-new market dinner schedule for 2015, welcoming Canada’s top talent into their Granville Island bistro for a coast-to-coast dinner series. At the start of each month, the popular Granville Island eatery will host a four course kick-off dinner for 75 people. These dinners will showcase the regions top culinary talent with the best ingredients, traditions and stories from the lands. Their line up includes Top Chef Canada winner Dale MacKay, Slow Food pioneer Michael Howell and Montreal’s celebrated Chef Derek Dammann of Maison Publique, to name a few. Edible Canada’s new and creative Bar Manager, Zack Shave, and Retail Manager, Natalie Graham, will also be joining in on the fun. Guests of the bistro can expect drink specials each month that reflect the specialties of each area, as well as an array of products for purchase that have been selected from artisans across the country. The 2015 Coast-to-Coast dinner series will be kicking off with the Yukon, a territory often underestimated for it’s culinary glamour. The team is excited to welcome Chef & Author Miche Genest, Chef Carson Schiffkorn from Inn on the Lake in Whitehorse, and Outfitter Teena Dickson, who will regale diners with stories of the North. 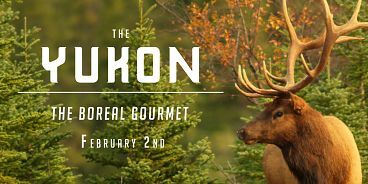 Also joining in on the epic dinner will be Yukon Brewing, showing off their range of beers and spirits hand-crafted in this northern territory to pair perfectly with wild game meat, berries, foraged foods and more! As a bonus for attending the opening event, guests will be entered TWICE into the month long contest that will allow one a lucky diner to win 2 tickets from Air North to Edible Canada’s very first Whisky Dinner in the Yukon. The dinner will be hosted this April under the Northern Lights and will be prepared by Chef Schiffkorn and Pateman himself. This is an opportunity you won’t want to miss! As an opening special, the first dinner of the series will be offered at the exceptional rate of only $75 a ticket, a 40% savings from the remaining ticket prices. Price per ticket is $125 and includes food, beverage pairings and gratuities. Menus and details around the specific dinners will be released closer to the date. As these are unique and individual evenings, it is highly recommended reserving tickets in advance; with the caliber of these chefs and a limited number of tickets available, the dinners are expected to sell out quickly. For the ultimate experience, there is the option to purchase tickets to the entire Coast-to-Coast Dinner series at a discounted price of $875. This means you get the first dinner completely FREE. Series tickets include preferred and reserved seating, signed cookbooks, artisan retail gifts and VIP access to all other Edible Canada events.